Dog-owners in Halifax’s North End are upset over the potential loss of Fort Needham Memorial Park as an off-leash dog park as it transitions into a tourist attraction. 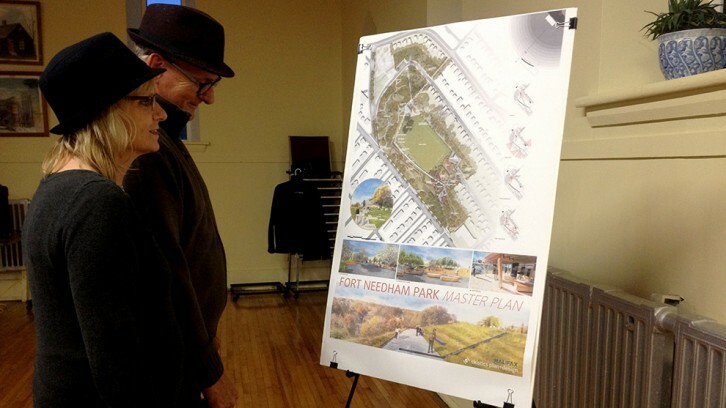 The Halifax Regional Municipality invited guests Thursday evening to attend the unveiling of the Fort Needham Memorial Park master plan at United Memorial Church. The event consisted of a presentation outlining the design plans for the park followed by public discussion. The master plan is the result of a series of community consultations which first began in February 2013. These consisted of two public meetings and two design workshops, and most recently two online surveys. Carole Koziak-Roberts, who presented the policy and planning aspect of the master plan, said 27 per cent of people who go to Fort Needham are bringing a pet. However, an off-leash dog park was not included in the proposal. The $7.9 million plan is divided into three stages, with an emphasis on completing major projects, including the bell tower plaza, during the first two stages. The goal is for the project to be completed in time for the 100th anniversary of the Halifax explosion on Dec. 6, 2017. Increased accessibility to the park, developed walking trails, a sensory park for children with impairments and better views from inside and outside the park were also key elements in the design. Rebecca de Conde and Ali Barnim have been living in the North End for several years and were two of many attendees who spoke up during public discussion about their concern over losing the off-leash dog park. Design plans for the park include a “shattered path” and waved landscape, which is intended to represent shock waves that resulted from the Halifax explosion. de Conde said it feels like the design was trying to form a community when there was already one present. Community members attested to the fact that the primary use of the park currently is for dog owners who wish to let their dogs off-leash and that there isn’t another option for this type of recreation in the North End. Koziak-Roberts responded to comments during the discussion by explaining that she recognizes having an off-leash dog park is important to the community, however the committee doesn’t have “information or direction from council yet” on how an off-leash dog park will fit into the plans.